I am a huge fan of runner games, I’ve been completely hooked on them since the 2009 release of endless runner Canabalt ($2.99). However, I often find all runner games to be quite similar, not a problem if you are a fan but if you’ve played ten or twenty you’ve definitely exhausted the possibility of finding something new and improved within the genre. Enter Moon Surfing (Free) developed by Christian Schnellmann! I have not been able to put my phone down since downloading it. In fact the only reason I am writing the review is because my battery needs to recharge before I can play again. 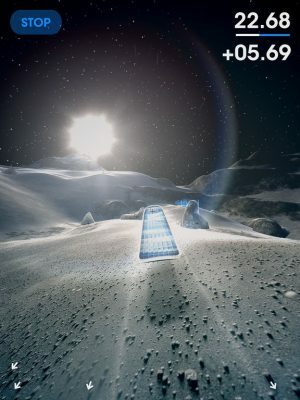 Moon Surfing is far removed from your typical runner games. To start with it is not an endless or auto-runner. You start at a basecamp and armed only with a trusty, solar powered, hoverboard and 40 seconds on the clock, make your way to one of several other basecamps in the chosen terrain. Swiping left or right you control direction within this mostly open world terrain, by lifting your finger your hoverboard jumps, landing either once it comes down again or when you touch the screen again. The great thing about jumps is time freezes while you’re in the air, learning to use the environment to your advantage to make lengthy jumps can really help you make it to the next basecamp before time runs out. I really want to be able to say the jumping feature is amazing, and while it is heaps of fun to fly through the air there is a part of me longing for the developers to integrate the danger of no gravitational force into the jumping mechanics. How cool would it be to have to time and place your jumps just right for fear of floating off the surface if you went too high? If you think picking on the physics of landing jumps with your solar hoverboard on the moon seems a bit petty, you would be right. Nevertheless, I want to provide an open and honest review, and while I play my brain keeps piping in with, “there is no gravity on the moon, surely some of these big jumps would see you float away”. After the gravitational issue, there is only one other aspect of gameplay, which some may view as a disruption to their game play. When the hoverboard bumps into something solid or goes reaches the limit of one of the too high walls, it bounces like a pinball, before moving forward again. This means you may lose precious seconds as your hoverboard hits the same obstacle, or even bounce between a few objects before you are able to gain control again. How much of an issue this is for you personally will depend on whether you like a nice easy game experience or come from the school of “git good”. I assess it firmly from the point of view, learn to steer well enough to not hit things, I can however understand how this slightly awkward bump (all pun intended) might be jarring and take away the simple joy of cruising the moon on your hoverboard. The open world of Moon Surfing is another fantastic change to the runner type games before it. 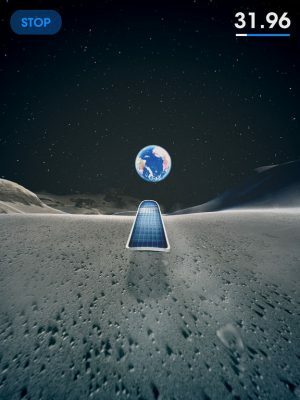 Not only can you choose which direction to fly your hoverboard over the chosen terrain, the game also gives you the option to choose any co-ordinates on the moon to land your hoverboard and get to surfing. The game gives you a linear path to follow if that is what you want to do, but after the first seven checkpoints you do have to pay to continue the linear path. Being able to choose anywhere on the moon’s surface within those first seven checkpoints means there is a lot of content to explore without ever having to pay to play. If you are someone like me who rarely plays new game plus and finds replaying games (no matter how good they are) tedious, the ability to move off course and explore every part of the moon makes replayability a moot point. Even if you choose to pay to explore the whole moon, there is so much to explore, before you possibly come close to repeating yourself. I purchased the full game before I realised I could explore territory off the linear checkpoints, I thought it was worth it then and now I realise how much of the moon is open to me, its even more worthy of my money. The simple aesthetics of the game are delightful. Barren landscape with a back drop of stars and (at the right angle) a very earth like planet against the horizon. When you do not make it to a basecamp in time and need to try again, the former path of your board is marked in the surface of the moon. Watching the patterns as your tries flow over each other can be quite mesmerising, while racing the clock to make a check point that may be just out of reach gets the heart racing. I have lost count of how many times the frustration of taking a wrong turn has made me shout at my phone, and you will too. Knowing the base camp is just there on the other side of that insurmountable wall, the clock ticking down the last three seconds. Deep down you know it’s your fault, but right this moment how dare your phone let you down. There are no achievements per se in Moon Surfing, but the developer Christian Schnellmann has included a little gift for those of us who chase accomplishment and closure in our games. Each basecamp you make it to reveals a letter, hitting every basecamp in an area spells out a word. I’ve added a personal achievement I’m yet to attain, spelling a word in order. Be sure to brag in our forums if you manage it!